Instinctive Notes is the Front Desk App you wish you had when taking your notes. Add our compliant note taking to Front Desk, one of the best practice management systems out there, and watch your productivity take off. Using the Front Desk iCalendar feed, Instinctive Notes utilises your Front Desk data to enhance the Front Desk experience. You want the information you already have in Front Desk to be available without having to think about it. Instinctive Notes collects Front Desk data every five minutes of the working day so that your client and appointment lists in the Instinctive Notes App are up to date. We download clients and appointments for the next seven days every five minutes through your Front Desk iCalendar feed. Multiple feeds are supported if you have multiple locations or multiple Front Desk appointment columns. Whatever data you need for your notes it will be available in Instinctive Notes when you need it, all without rekeying. Due to the limitations of the Front Desk iCalendar feed client records will not be available in Instinctive Notes until there is appointments for the client in the coming week. That's all you have to do to get all your Front Desk data into the Instinctive Notes App. Your appointments are listed direct from Front Desk. Any updates, cancellations or no shows will be automatically processed from the list. Appointment type colours can be set against your Front Desk appointment types to let you know exactly why you are seeing each of your clients. All you need is your Front Desk iCalendar feed and your email address and you're up and running. Once your Front Desk iCalendar feed is set up and working just add your practitioners to Instinctive Notes along with their feed URL's and you'll be off and running. By the time you have logged into the Instinctive Notes App on your iPhone or iPad your appointments will already be available. Additionally configure appointment types, locations, products and assistant users to get the most out of Instinctive Notes. 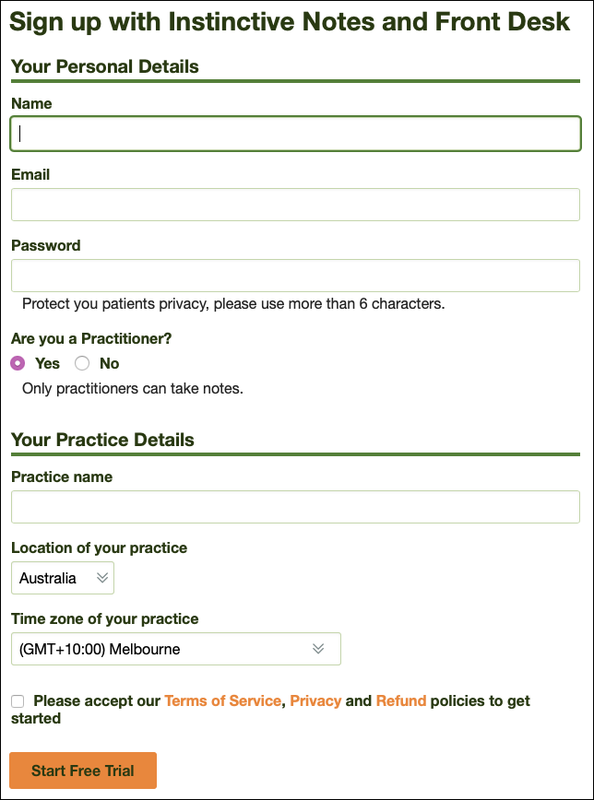 "Front Desk Practice Management System® is one of the best software packages available for running a health practice. The package is a receipting/billing system with an integrated appointment book, practice accounting, clinical notes, practice management reporting and marketing tools to help service and stay in contact with your patients." If you don't use Front Desk to manage your practice and want to know more, just hop on over to the Front Desk Web Site, you won't be disappointed. As you would expect, we think Front Desk works even better when linked with Instinctive Notes. Why don't you try us both today.